For many young people, weekends and school holidays are a chance to catch up with friends and have fun doing their favourite activities. Young carers often miss out on opportunities like these because they are needed at home, their family has financial difficulties or they simply don’t have access to transport. Young carers are children, or young people up to 25 years of age, who help care for a family member with a chronic illness, disability or drug/alcohol dependency. Across Australia, over 380 000 children and young people help care for their relatives. The St Vincent de Paul Society offers a host of services and programs for young people in every state and territory in Australia, including programs specifically aimed at young carers. We also support the work of peak bodies such as Carers Australia, who give a voice to the 2.7 million carers in Australia, and remind us of the vital and, largely unrecognised role, that carers play in our community. To learn more about the support the St Vincent de Paul Society provides young carers, read the case study below. Young carers take time out to enjoy holiday activities. Fifteen years ago in Canberra a group of volunteers running camps for vulnerable children noticed that many of the kids, who attended camps took on a caring role in their family. The volunteers realised that these children faced unique challenges due to their caring role. In response to this need in the community, the volunteers set up a youth program for young carers aged 9-15 years. The program is called the St Nick’s Young Carers Program. Social isolation is a common issue for young carers and the St Nick’s monthly activities provide them with an opportunity to make social connections with other young people who understand what it is like to be a carer. 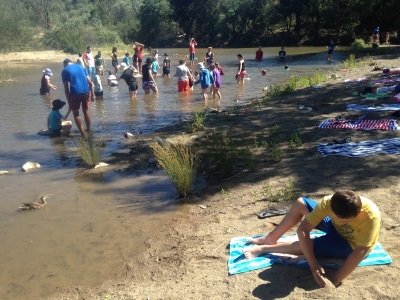 St Nick’s now provides respite and recreation to over 100 young carers in the Canberra/Goulburn region in the form of school holiday camps and weekend activities. The program is not government funded and the four camps and 12 weekend activities per year are entirely supported by the St Vincent de Paul Society through donations. The program is staffed by volunteers aged 21 years and over. The kids call them ‘oldies’ because apparently anyone over 21 is ancient. The ‘oldies’ not only run the activities, and ensure that all the young carers are safe and having fun, they also form a Youth Conference, which is responsible for receiving referrals from community organisations, planning the events for the year, recruiting new ‘oldies’ and fundraising. 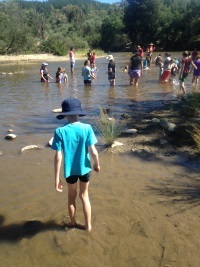 A participant in the St Nick’s Young Carer Program wades into the creek. In 2014, St Nick’s Young Carers Program won the Volunteer Team of the Year award at the ACT Volunteer of Year Awards, showing that the program is held within high regard in the local community. A unique aspect of St Nick’s is the Junior Oldie Program. This was developed to encourage program participants to return to the program as volunteers once they turn 18. They are provided with extra support to aid their transition from participant to volunteer. The contribution of the Junior Oldies is so special because they have an insight into what it is like to be a young carer. It is also an excellent opportunity for these young people to further develop their experience and leadership skills. During the first week of January, 2015, St Nick’s ran a five day holiday camp for 41 young carers aged 9-15 years. The young carers were delighted to discover that beautiful Werri Beach in Kiama, NSW was only 500m from the campsite. The group spent most afternoons at the beach, avoiding the seaweed patches in the water, building sand castles and exploring the rock pools. Kids were occupied with carnival-themed outdoor games, craft, board games and Carers Time. 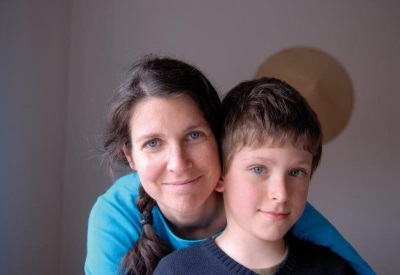 A young carer with his mother. Carers Time is a therapeutic style session that encourages the kids in their age groups to talk about their experiences as young carers; this includes the challenges and the positives. The leaders focus on building resilience in the young people through these sessions and encouraging positive coping strategies for difficult situations such as bullying, social isolation and family conflict. Fortunately many of the ‘oldies’ in this program are professional youth workers, mental health workers or social workers and are able to utilise their skills on camp. For anyone interested in volunteering for this program or other ACT youth programs, please visit the Get Involved section of our website. Volunteer with kid’s camps and children’s activities in your state or territory.